Background: Complex regional pain syndrome (CRPS) is characterized by disabling pain, swelling, vasomotor instability, sudomotor abnormality, and impairment of motor function. An integrated multimodal multidisciplinary treatment approach is recommended to treat CRPS including pharmacological treatment, interventional therapy, and physiotherapeutic management. As imaging studies indicate that CRPS is associated with manifestation of changes in brain, mirror visual feedback (MVF) therapy may also have effect in neuromodulation and cortical reorganization. Aims and Objectives: The aim and objective of this study are to compare the effectiveness of MVF therapy with other conventional treatment. Subjects and Methods: A total 30 patients were selected and randomly allocated into three groups. Group C was treated with pharmacological management with contrast bath, Group E was additionally treated with exercises, and Group M was additionally treated with MVF therapy. Prognosis of the patients was documented on the basis of pain at rest, on movement, and swelling. Statistical Analysis Used: Two-way (3 × 4) ANOVA test. Results: Patients with CRPS were benefited by pharmacological therapy, physical exercises, and mirror therapy as pain in rest and on movement improved over time. However, patients, additionally treated with mirror therapy, improved to a greater extent when compared to the other groups. Conclusion: MVF therapy has been established as a low-cost treatment technique for CRPS along with other conventional treatments. Complex regional pain syndrome (CRPS) is a chronic neurological disorder characterized by nondermatomal, distal predominant disabling pain, swelling, vasomotor instability, sudomotor abnormality and impairment of motor function.,,, Pain in CRPS can be expressed as continuing spontaneous evoked regional pain often disproportionate in time and degree to any trauma or any other lesion. CRPS has been described by a number of terminology including causalgia, Sudeck's atrophy, reflex sympathetic dystrophy, algodystrophy and shoulder-hand Syndrome. CRPS is an uncommon disease with a prevalence of <2% in most retrospective studies., A higher incidence of CRPS is reported in patients between the ages 61–70 years and in woman (76%). The upper extremity is affected twice as commonly as the lower limb, and fracture is the most common trigger (46%). In 10%–26% of patients with CRPS, no precipitating factors can be found. In CRPS, there is interplay between central and peripheral pathophysiology. Some studies conclude that an initial noxious stimulus in the periphery results in a state of hyperexcitability in the spinal cord neurons. In sympathetic-mediated pain, the nociceptive input is maintained by an interaction between primary afferent and sympathetic efferent through an adrenergic mechanism., Widespread alterations in sensory perception and peripheral changes (autoimmune and somatosensory) in CRPS must be viewed as manifestation of changes in brain. Brain imaging studies indicate that the alteration of afferent input leads to cortical and thalamic plasticity and reorganization of sensory representation in patients with CRPS. Increased brain responsiveness among CRPS patients in some imaging studies supports the presence of central sensitization. CRPS is diagnosed using “Budapest Criteria” (2003) in which the entity is meant to be descriptive, general, and not to imply any pathophysiology. It includes the presence of pain, hyperalgesia, allodynia, other sensory, vasomotor and sudomotor abnormality, and motor and trophic changes. An integrated multimodal multidisciplinary treatment approach is recommended and tailored to the individual patients with primary aim to reduce pain, restore function, and enable patients to improve their quality of life., Pharmacological treatment with simple nonsteroidal anti-inflammatory drugs and neuropathic medicine, interventional therapy with intravenous regional anesthesia, sympathetic block, spinal cord stimulation and physiotherapeutic management with Transcutaneous Electrical Nerve Stimulation (TENS), exercise, splinting, and cryotherapy are among the conventional approaches of treatment. The use of visual illusion created by a mirror was first introduced by Ramachandran VS, Rogers-Ramachandran in 1995. Mirror visual feedback (MVF) therapy is a neurorehabilitation technique designed to remodulate the cortical mechanism of pain. In CRPS, an attempt to move the limb cause severe pain, so very attempts get linked in a Hebbian manner to pain, associated memories remained even when inflammation itself is no longer there. It is called learned pain. Mirror therapy is used to unlearn the learned pain. In this, the patients perform movement of the unaffected limb while watching its mirror reflection superimposed over the (unseen) affected limb, thus creating a visual illusion of the affected limb movement. The visual illusion of the affected limb movement generates positive feedback to the motor cortex and would restore the integrity of cortical mechanism, which might in turn interrupts with the pain cycle and restoring function in the affected limb. Although mirror therapy has been successfully used in different cases, still there is a paucity of enough literature to compare the effectiveness of MVF therapy with other conventional management in CRPS. To compare the effectiveness of mirror therapy with other conventional treatments. The Institutional Ethics Committee approval has been obtained before initiation of this study. The study was registered in the Clinical Trial Registry of India with reference no REF/2017/02/013543. 30 patients, who came to an urban pain referral centre from January 2016 to June 2016 (6 months) and fulfilled the inclusion criteria, participated in the study. All of the patients in our study were male patients as our patients were industrial workers who are male predominant. Informed written consent was obtained from each patient. Patients already treated with neuropathic medicine for at least 4 weeks. Vascular conditions such as vascular insufficiency, deep vein thrombosis, lymphedema, and erythromelalgia. The patients were asked to draw a chit from a jar containing 30 chits (10 chits for each group), and they were randomly allocated into following three groups containing ten patients in each group. Group M: Mirror group – Patients of this group were treated same as Group C along with motor imagery through MVF therapy. Assessments of all the patients were done at the time of presentation (day 0), after 1st week (day 7), 2nd week (day 14), and 4th week (day 28). Mirror therapy: Patient were asked to sit comfortably keeping a mirror perpendicular to midline with unaffected side in front of the reflecting surface of mirror and affected side hidden behind the mirror. The affected limb was relaxed and rested on a support surface behind the mirror throughout the period of mirror therapy. Patients were asked to look at the mirror and assume the mirror image of unaffected side as affected body part. The patient performed exercise of the unaffected body part in a full and pain-free range in all direction front of mirror. 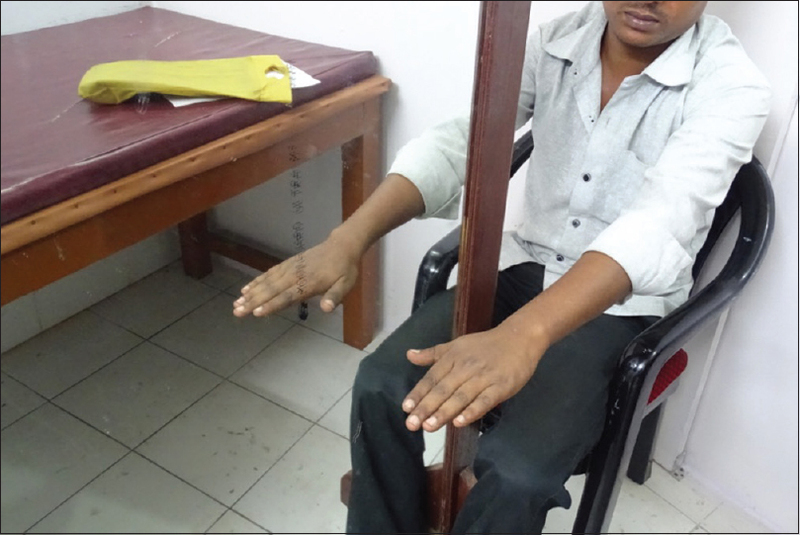 By seeing the mirror image patient imagined the affected limb was moving in pain-free manner [Figure 3]. Patients performed exercise in a 2 min on-off mode for 20 min twice a day. Subjects in all groups reported a decrement in pain score with time with treatment when compared with initial assessment [Table 1]. Group M, which was additionally treated with mirror therapy showed significant improvement when compared with Group C and Group E.
There was a main effect of groups F = 72.49, P < 0.0001, and time effect F = 70.26, P < 0.0001. Main effects were also qualified by Group X time interactions F = 8.98, P < 0.0001. Tukey's honestly significant difference (HSD) Post hoc analysis revealed a significant difference in pain scores from pre to post in all three groups. This effect sustained in Group M for 4 weeks with continued therapy, while other two groups failed to show a significant effect in sustainability after 2nd week. There was no significant difference found between control and exercise groups with continued treatment for 4 weeks. Group M showed significant improvement when compared with Group C and Group E which sustained with time [Bar Diagram 1]. Subjects in all groups reported a decrement in pain on movement score with time with treatment when compared with initial assessment [Table 2]. There was a main effect of groups F = 66.08, P < 0.0001 and time effect F = 97.01, P < 0.0001. Main effects were also qualified by Group X time interactions F = 13.3, P < 0.0001. 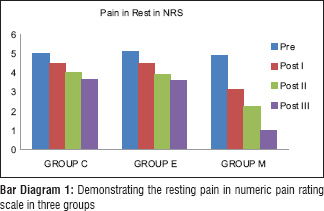 Tukey's HSD Post hoc analysis revealed a significant difference in pain scores from pre to post in all three groups. This effect sustained in Group M for 4 weeks with continued therapy. There was no significant difference found between control and exercise groups with continued treatment for 4 weeks. Group M showed significant improvement when compared with Group C and Group E which sustained with time [Bar Diagram 2]. Subjects in all groups showed a decrement in swelling with time following treatment when compared to initial assessment, though it failed to touch the level of significance, might be because of type II error [Table 3]. There is no significant difference between Group M in swelling when compared to Group C and Group E.
F value of groups is 0.25, P = 0.7793 and time = 0.63, P = 0.5972. Tukey's HSD Post hoc analysis revealed no significant difference in swelling from pre to post in all three groups. 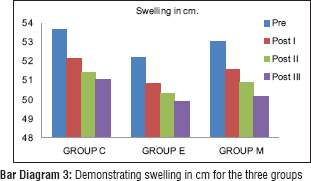 Group M also failed to show any significant improvement in swelling when compared with Group C and Group E [Bar Diagram 3]. In the present study, motor imagery using MVF method has been proven to be effective in relieving pain in patients with CRPS when compared to conventional management [Figure 4]a and [Figure 4]b. In MVF therapy, the centrally processed congruent visual feedback from moving unaffected limb, provided by the mirror which appears to originate from dysfunctional and painful side acts to establish the normal pain free relationship between sensory feedback and motor intention, restore the integrity of central processing, and consequently results in a rapid resolution of pain state and restoring function of the affected limb. When patients look at the visual reflection of the unaffected hand, however, he sees, there is no external object causing the pain in the optically resurrected limb, so his brain rejects the pain signals as spurious. It is a matter of how different signals are weighted and integrated – or Gate each other– in the construction of body image – even without seeing it moved – might provide partial relief. 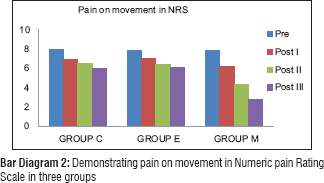 Swelling had reduced clinically in all three groups but failed to show significance while comparing between the groups might be because of the fact that, we have used contrast bath in all three groups in a similar manner. The study has been conducted in a single institute only. Overall, the study concluded that patients with CRPS benefited by pharmacological therapy, physical exercises, and mirror therapy as pain in the rest and pain on movement improved over time. However, patients treated with mirror therapy along with the conventional therapy improved in a greater extent when compared to pharmacological therapy or exercises. We sincerely acknowledge the help from Dr Pradip Kumar Bhattacharjee, Director of ESI-IPM, for his kind permission, Dr Amit Chackrabarti, scientist E, ICMR, for data analysis, Ms Shagufta Kaur Bhangu for her guidance and support and Mr Debankan Bhattacharya for sincere technical assistance during this study. Royal College of Physicians. Complex Regional Pain Syndrome in Adults-UK Guidelines for Diagnosis, Referral and Management in Primary and Secondary Care; May, 2012. Stanton-Hicks M, Jänig W, Hassenbusch S, Haddox JD, Boas R, Wilson P, et al. Reflex sympathetic dystrophy: Changing concepts and taxonomy. Pain 1995;63:127-33. Baron R, Fields HL, Jänig W, Kitt C, Levine JD. National institutes of health workshop: Reflex sympathetic dystrophy/complex regional pain syndromes – State-of-the-science. Anesth Analg 2002;95:1812-6. Veldman PH, Reynen HM, Arntz IE, Goris RJ. 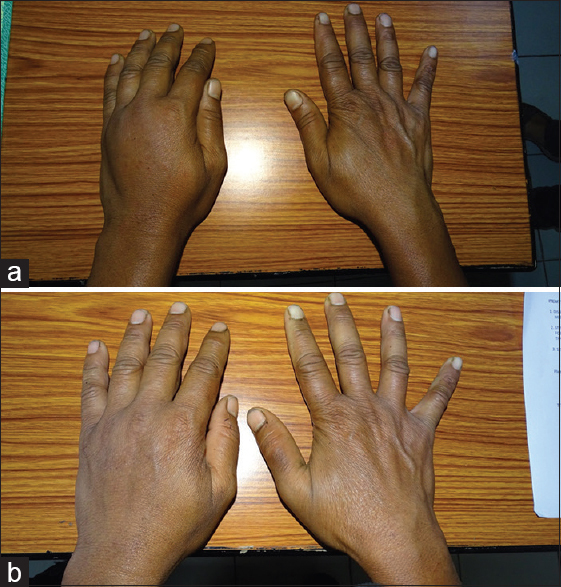 Signs and symptoms of reflex sympathetic dystrophy: Prospective study of 829 patients. Lancet 1993;342:1012-6.
de Mos M, de Bruijn AG, Huygen FJ, Dieleman JP, Stricker BH, Sturkenboom MC, et al. The incidence of complex regional pain syndrome: A population-based study. Pain 2007;129:12-20. Sandroni P, Benrud-Larson LM, McClelland RL, Low PA. Complex regional pain syndrome type I: Incidence and prevalence in Olmsted county, a population-based study. Pain 2003;103:199-207. Albazaz R, Wong YT, Homer-Vanniasinkam S. Complex regional pain syndrome: A review. Ann Vasc Surg 2008;22:297-306. Torebjörk E, Wahren L, Wallin G, Hallin R, Koltzenburg M. Noradrenaline-evoked pain in neuralgia. Pain 1995;63:11-20. Ali Z, Raja SN, Wesselmann U, Fuchs PN, Meyer RA, Campbell JN, et al. Intradermal injection of norepinephrine evokes pain in patients with sympathetically maintained pain. Pain 2000;88:161-8. Jänig W, Baron R. Complex regional pain syndrome is a disease of the central nervous system. Clin Auton Res 2002;12:150-64. Fink GR, Marshall JC, Halligan PW, Frith CD, Driver J, Frackowiak RS, et al. The neural consequences of conflict between intention and the senses. Brain 1999;122(Pt 3):497-512. Harden RN, Bruehl S, Stanton-Hicks M, Wilson PR. Proposed new diagnostic criteria for complex regional pain syndrome. Pain Med 2007;8:326-31. Bruehl S, Harden RN, Galer BS, Saltz S, Bertram M, Backonja M, et al. External validation of IASP diagnostic criteria for complex regional pain syndrome and proposed research diagnostic criteria. International Association for the Study of Pain. Pain 1999;81:147-54. Harden RN. Complex regional pain syndrome. Br J Anaesth 2001;87:99-106. Bruehl S. Complex regional pain syndrome. BMJ 2015;351:h2730. Ramachandran VS, Rogers-Ramachandran D. Synaesthesia in phantom limbs induced with mirrors. Proc Biol Sci 1996;263:377-86. Ramachandran VS, Altschuler EL. The use of visual feedback, in particular mirror visual feedback, in restoring brain function. Brain 2009;132:1693-710.
van de Vusse AC, Stomp-van den Berg SG, Kessels AH, Weber WE. Randomised controlled trial of gabapentin in complex regional pain syndrome type 1 [ISRCTN84121379]. BMC Neurol 2004;4:13. Perez RS, Zollinger PE, Dijkstra PU, Thomassen-Hilgersom IL, Zuurmond WW, Rosenbrand CJ, et al. Clinical practice guideline 'complex regional pain syndrome type I'. Ned Tijdschr Geneeskd 2007;151:1674-9. Hjermstad MJ, Fayers PM, Haugen DF, Caraceni A, Hanks GW, Loge JH, et al. 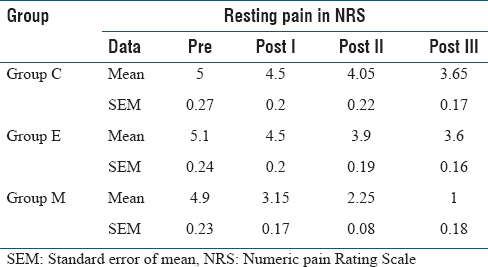 Studies comparing numerical rating scales, verbal rating scales, and visual analogue scales for assessment of pain intensity in adults: A systematic literature review. J Pain Symptom Manage 2011;41:1073-93. Maihafer GC, Llewellyn MA, Pillar WJ Jr., Scott KL, Marino DM, Bond RM, et al. A comparison of the figure-of-eight method and water volumetry in measurement of hand and wrist size. J Hand Ther 2003;16:305-10. Pellecchia GL. 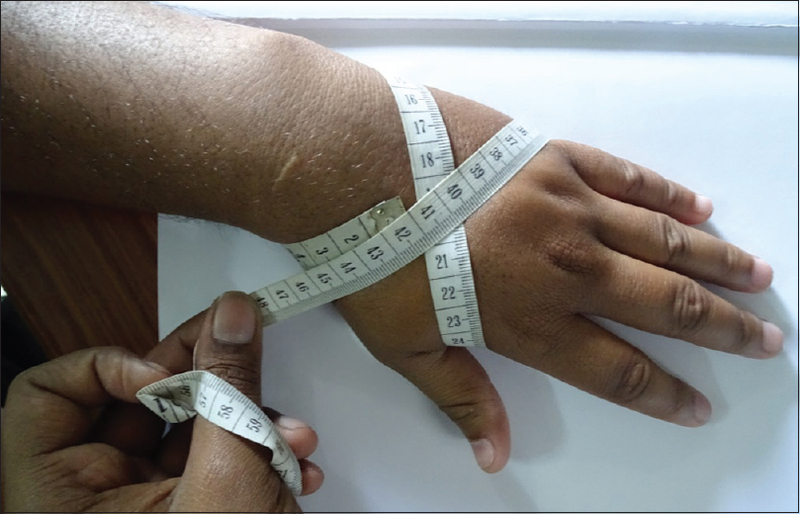 Figure-of-eight method of measuring hand size: Reliability and concurrent validity. J Hand Ther 2003;16:300-4. Breger Stanton DE, Lazaro R, Macdermid JC. A systematic review of the effectiveness of contrast baths. J Hand Ther 2009;22:57-69. McCabe CS, Haigh RC, Ring EF, Halligan PW, Wall PD, Blake DR, et al. A controlled pilot study of the utility of mirror visual feedback in the treatment of complex regional pain syndrome (type 1). Rheumatology (Oxford) 2003;42:97-101. Cacchio A, De Blasis E, De Blasis V, Santilli V, Spacca G. Mirror therapy in complex regional pain syndrome type 1 of the upper limb in stroke patients. Neurorehabil Neural Repair 2009;23:792-9. Cacchio A, De Blasis E, Necozione S, di Orio F, Santilli V. Mirror therapy for chronic complex regional pain syndrome type 1 and stroke. N Engl J Med 2009;361:634-6. Thieme H, Morkisch N, Rietz C, Dohle C, Borgetto B. The efficacy of movement representation techniques for treatment of limb pain – A systematic review and meta-analysis. J Pain 2016;17:167-80.